For the last last and final day of Salads, I have this pachadi from Kerala made with cucumber. Until that moment of making it myself, we never knew why the pachadi served in the feast tasted so delicious. When Amma tasted it, she was so happy saying this is what she always wanted to know. This is such a simple recipe, yet it eluded us for so long. Try this and I am sure you will love it! Typically even though sometimes we do not make a practise of having pachadis served for every meal, it is mandaroly made during festival feasts and occasions. Pachadis can be made with sour fruits and water based vegetables like the cucumber, squash and other vegetables like mango and carrot. What I found interesting is the mango and pineapple being used in a pachadi in kerala and karnataka cuisine. Whereas we have just the cucumber pachadi being famous in Andhra. Salads like this surely makes a meal very filling and satisfying. 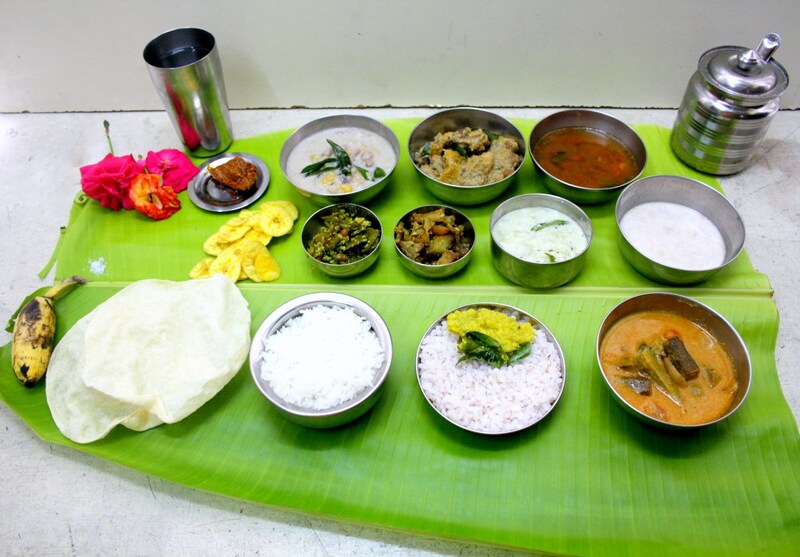 This was part of the Onam Sadya that I made prepared couple of months back and was inspired by this. 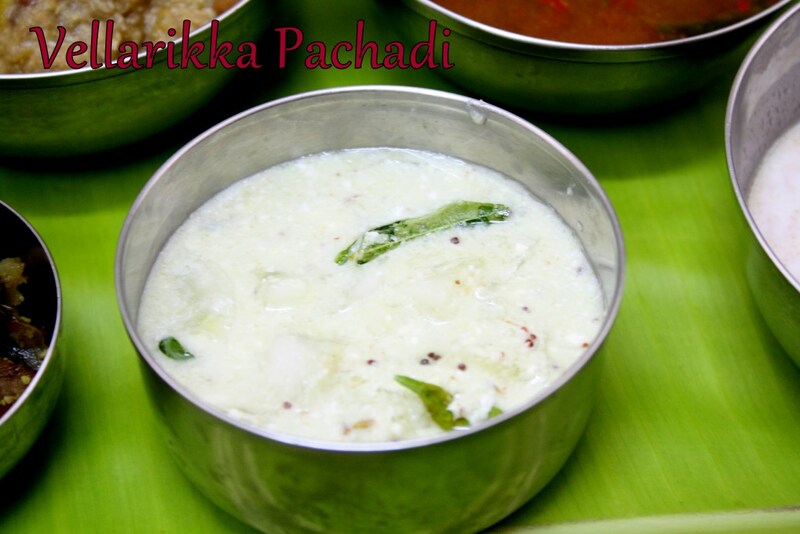 If you can make this pachadi for mixed rice dishes as well like the Kovil Puliyodharai that I made. 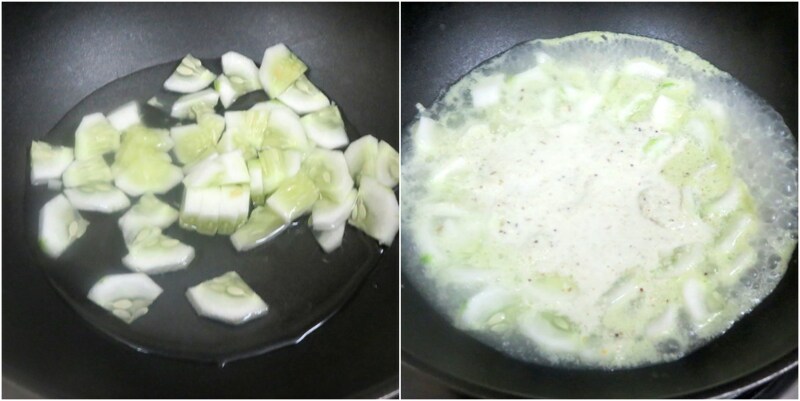 Cook the chopped cucumber with salt, adding little water till it turn to soft. Grind the grated coconut, green chillies, ginger and 1/2 tsp mustard seeds into a smooth paste with 1/4 cup yogurt. Add the coconut paste to the cooked cucumber and cook over low flame. Allow to cool and add the rest of the yogurt and set it aside. Heat oil for tempering in a small pan and add the curry leaves, mustard seeds, when the mustard seeds start popping, add it to the pachadi and mix well. Wonderful and healthy salad, who will say no to this vellarika pachadi. That tiny bit of mustard seeds in the grinding mixture makes a great impact on the flavor. I love that taste! And yes, we do have mango and pineapple pachadi as well. Its prepared differently in different regions, but fruits are a popular choice for pachadi there. What an interesting cucumber pachadi Valli. I'm going to try it soon. Oh! this is a cooked pachadi. Am used to having it raw and I absolutely love all kinds of Pachadi. Can have it with every meal. Love this spicy pachadi. This is how my mom makes it on festival days and I love to dunk my vadai in it and eat. I thought it was perugu pachadi until I saw that it is a cooked version. Interesting one, Valli. Good one Valli. Mustard adds a definite flavor to the dish.